Dan posing with our new friends, the children of a kind family that invited us in to their home for lunch. DIDN'T LOVE: The Excessive Plastic. There is a serious problem with the amount of plastic in the region. Garbage clusters around houses, riverbanks and markets. It’s sobering. It's hard not to feel like we were contributing to the problem. Because of the lack of clean drinking water we started off buying water bottles, sealed with plastic at all of our meals. What we soon discovered is most restaurants and street food vendors use water from giant water dispensers. Bringing our bike bottles everywhere helped cut down on our waste big time. Not everything in Vietnam is Instagram-Perfect. LOVE: The overwhelming smell of tropical flowers. Plumeria, Bougainvillea and Jasmine to name a few. Taking our bikes on Google’s “Walking Routes” meant weaving our way through jungle, on sidewalk-width paths of concrete, dirt or stones. While I can’t complain about the cycle touring equivalent of singletrack, some bridges rivalled that of Vancouver’s North Shore. Throw in some fairly murky water and the chance of crocodiles and you better believe I pedalled my heart out to reach the other side of every nutty bridge in our path. There is actually order in the madness of traffic in Vietnam. There's a system to navigating the sea of scooters, trucks and cruiser bikes in each town. Traffic may slow to a walking pace, but it almost never stops - it’s actually quite efficient. When we dive into the flow, our biking pace is often similar to scooters. It’s manageable, but requires ninja-like focus. It appears that almost everyone in the Mekong Delta is astonished that we chose to ride bikes versus scooters through the region. As we passed rice paddies, freeways, cities and village streets, everyone shouts hello when they see us coming. It’s a cheerful welcome but sometimes a funny scenario plays out. When we return “hellos” back, most people pause unsure of what to do next then serve us up with another “hello”. Thus, “Hello Tennis” was born. On longer stretches of road, we might play 3 or 4 rounds before breaking into laughter on both sides. MIXED LOVE: The Meal Dance. Ordering food is a bit of a luck of the draw. We look at Vietnamese menus and point to what we think might be veggies or fish. Even in the plentiful amount of vegan restaurants (which we adore), we’re never really sure what style dish we’re going to get. If you know me personally, you’ll know I’m pretty serious about my nutrition (check out my post about Gluten Free/Veggie Cooking in New Zealand), but here I have to be a bit more fluid with my choices. The reality is that nearly everything has been delicious, so as long as it’s pescatarian, I’m stoked. My favourite? 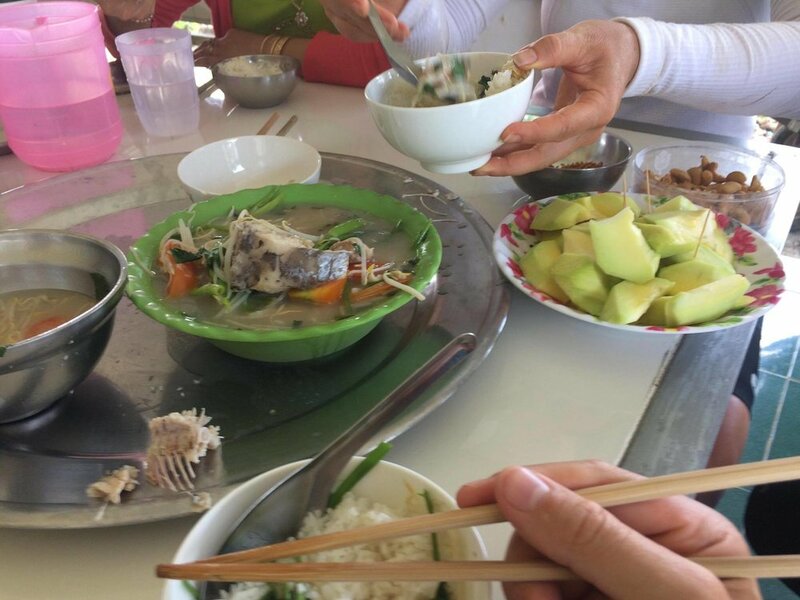 The sour fish soup, a speciality of the Mekong region. We're looking forward to more exotic beauty and excitement as we leave the Mekong Delta and into Cambodia.